Caratteristiche: Questo vino è stato introdotto nel 2015 dal Marchese Niccolò Antinori, padre di Piero Antinori, come il primo Chianti prodotto per essere invecchiato e migliorare nel tempo. Nel 2001, Piero Antinori inaugura una nuova evoluzione del Villa Antinori che diventa un Toscana IGT, prodotto con le migliori selezioni di uve provenienti esclusivamente dalle tenute di proprietà in Toscana. Il disegno dell'etichetta è rimasto invariato dal 2015: è stata solo leggermente ritoccata con l'annata 1990 e con il 2001. Rosso rubino intenso con note di frutta a bacca rossa e legno. Complesso ed elegante, ha tannini bilanciati e morbidi ed è ricco di estratti. "Wine Spectator" has rated the wine "Marchesi Antinori Villa Antinori Toscana IGT, Tuscany, Italy" the vintage 2013 on 30.06.2016 with 89 of 100 points. "Wine & Spirits Magazine" has rated the wine "Marchesi Antinori Villa Antinori Toscana IGT, Tuscany, Italy" the vintage 2012 on 01.04.2016 with 86 of 100 points. "Wine & Spirits Magazine" has rated the wine "Marchesi Antinori Villa Antinori Toscana IGT, Tuscany, Italy" the vintage 2014 on 01.04.2016 with 85 of 100 points. "Wine Spectator" has rated the wine "Marchesi Antinori Villa Antinori Toscana IGT, Tuscany, Italy" the vintage 2012 on 31.10.2015 with 87 of 100 points. 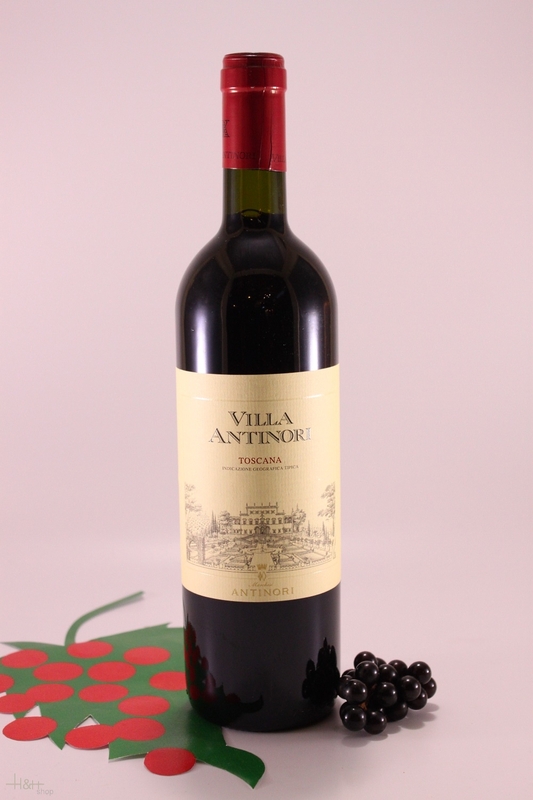 "Wine & Spirits Magazine" has rated the wine "Marchesi Antinori Villa Antinori Toscana IGT, Tuscany, Italy" the vintage 2011 on 01.04.2015 with 88 of 100 points. "Wine Spectator" has rated the wine "Marchesi Antinori Villa Antinori Toscana IGT, Tuscany, Italy" the vintage 2011 on 31.08.2014 with 90 of 100 points. "Wine Spectator" has rated the wine "Marchesi Antinori Villa Antinori Toscana IGT, Tuscany, Italy" the vintage 2010 on 30.04.2014 with 92 of 100 points. "Vinous Antonio Galloni" has rated the wine "Marchesi Antinori Villa Antinori Toscana IGT, Tuscany, Italy" the vintage 2010 on 01.08.2013 with 89 of 100 points. "Wine Spectator" has rated the wine "Marchesi Antinori Villa Antinori Toscana IGT, Tuscany, Italy" the vintage 2009 on 15.12.2012 with 90 of 100 points. "Wine Spectator" has rated the wine "Marchesi Antinori Villa Antinori Toscana IGT, Tuscany, Italy" the vintage 2008 on 30.09.2012 with 90 of 100 points. "Vinous Antonio Galloni" has rated the wine "Marchesi Antinori Villa Antinori Toscana IGT, Tuscany, Italy" the vintage 2009 on 01.06.2012 with 90 of 100 points. "Vinous Antonio Galloni" has rated the wine "Marchesi Antinori Villa Antinori Toscana IGT, Tuscany, Italy" the vintage 2008 on 01.08.2011 with 90 of 100 points. "Vinous Antonio Galloni" has rated the wine "Marchesi Antinori Villa Antinori Toscana IGT, Tuscany, Italy" the vintage 2007 on 01.08.2011 with 89 of 100 points. "Wine Spectator" has rated the wine "Marchesi Antinori Villa Antinori Toscana IGT, Tuscany, Italy" the vintage 2007 on 31.10.2010 with 88 of 100 points. "Wine Spectator" has rated the wine "Marchesi Antinori Villa Antinori Toscana IGT, Tuscany, Italy" the vintage 2006 on 31.10.2009 with 90 of 100 points. "Wine Spectator" has rated the wine "Marchesi Antinori Villa Antinori Toscana IGT, Tuscany, Italy" the vintage 2005 on 30.09.2008 with 87 of 100 points. "Wine Spectator" has rated the wine "Marchesi Antinori Villa Antinori Toscana IGT, Tuscany, Italy" the vintage 2004 on 31.10.2007 with 87 of 100 points. "Wine Spectator" has rated the wine "Marchesi Antinori Villa Antinori Toscana IGT, Tuscany, Italy" the vintage 2003 on 31.10.2006 with 87 of 100 points. "Wine Enthusiast" has rated the wine "Marchesi Antinori Villa Antinori Toscana IGT, Tuscany, Italy" the vintage 2002 on 09.01.2006 with 88 of 100 points. "Wine Spectator" has rated the wine "Marchesi Antinori Villa Antinori Toscana IGT, Tuscany, Italy" the vintage 2002 on 31.10.2005 with 83 of 100 points. "Wine & Spirits Magazine" has rated the wine "Marchesi Antinori Villa Antinori Toscana IGT, Tuscany, Italy" the vintage 2001 on 01.04.2005 with 88 of 100 points. "Wine Spectator" has rated the wine "Marchesi Antinori Villa Antinori Toscana IGT, Tuscany, Italy" the vintage 2001 on 31.10.2004 with 87 of 100 points. "Wine Enthusiast" has rated the wine "Marchesi Antinori Villa Antinori Toscana IGT, Tuscany, Italy" the vintage 2001 on 10.01.2004 with 91 of 100 points. 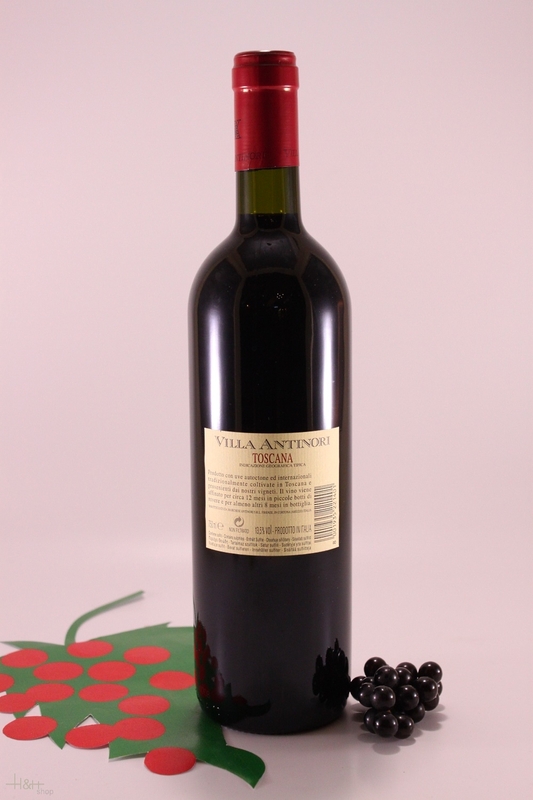 "Vinum Wine Magazine" has rated the wine "Marchesi Antinori Villa Antinori Toscana IGT, Tuscany, Italy" the vintage 1998 on 01.11.2001 with 15 of 20 points.